When was the last time you were offered a little bit of unexpected encouragement? Maybe it was a compliment on your outfit on a day you were feeling rough? Maybe it was a simple 'good job' on a task that you'd worked hard on. Maybe a friend called out of the blue just to check on you. Isn't it truly amazing how such a very simple act can turn your day around? You truly never know what someone is going through in life or what a simple smile and hello can do to turn it around. Still, all too often as we go on about our busy days, we just don't think about it. It's not that we don't care, it's just not in the forefront of our minds. Wouldn't it be great if we all decided to change that and make more effort? September 12 is the National Day of Encouragement- a day to remind us not to tear each other down but to build each other up. If you ask me, that's something we could all use a lot more of. 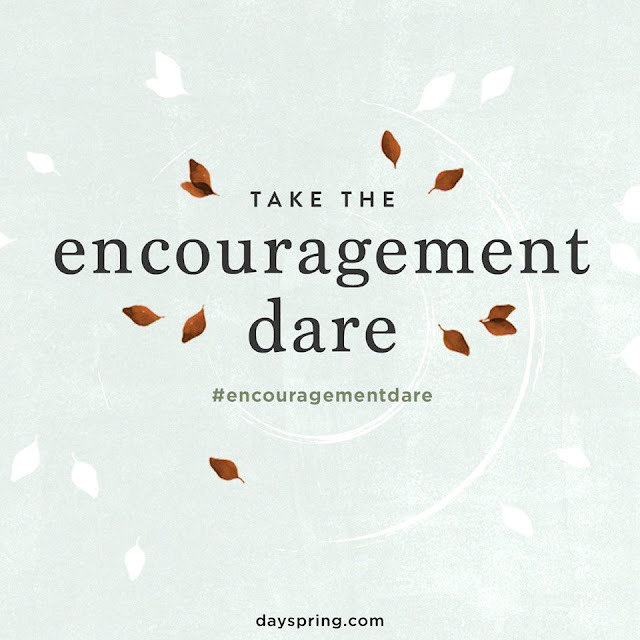 Once again this year, Dayspring is daring EVERYONE to step out of their comfort zone and offer encouragement during their #EncouragementDare. Are you ready? Throughout the week I will be sharing posts about encouragement, but we're starting today with some simple ways you can encourage those around you. Send a Card. Aside from birthdays, how often do you get cards in the mail? For most, it's probably not often, right? I don't know about you, but I personally love getting a handwritten card or note in the mail! It certainly beats bills. It doesn't have to be a long letter, just a quick note to say, "I was thinking of you!" You never know when that might be just what your loved ones need to hear. Smile & Say Hello. Simple enough, right? So often when we are out and about doing our daily errands, we get so caught up in what we're doing that we don't pay much attention to those around us. Make the effort to greet people warmly, a simple hello or even a few kind words can be a simple way to brighten someone's day. Lend a Helping Hand. Do you know someone that has a lot on their plate? Offer, even insist, on helping them lighten the load! Provide free babysitting to the overwhelmed mama that needs a shopping trip alone. Help with household chores like dishes or mowing the lawn that she just can't seem to get caught up with. Even provide a meal so she gets a night out of cooking. Look for ways to help a stranger when you're out too. Hold the door open, carry groceries to someone's vehicle...these simple gestures can mean the world and don't require money or much time at all. Pray for Them. Perhaps one of the greatest ways we can offer encouragement to those who need it is to lift them up in prayer. God knows their full needs, even if we do not and I know personally it means the world to me when I know others thought enough to keep me in their prayers when I needed it most. Simply Be There. From near or far, just be a listening ear when it's needed. Sometimes, all we need is that knowledge that you've got someone by your side. Spread the Word. Kindness can be contagious, so help spread the word about the Encouragement Dare through your own social media using the hashtag #EncouragementDare and encourage others to join in! Be sure to tag Dayspring in your shares too. Want to learn more about the encouragement day and how you can offer encouragement to others? Visit Dayspring to sign up for an encouragement kit filled with fun tips, free downloads and more! Will you be accepting the dare? Let me know how you plan to encourage others, and be on the lookout for more from me this week on encouragement. Take the #EncouragementDare today!